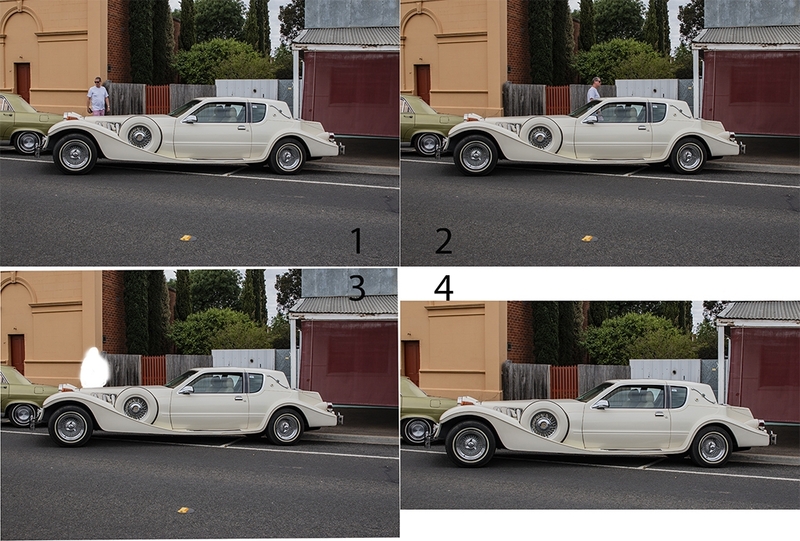 It has been suggested that some might like to know how I removed the unwanted figures from the Classic Ford photo. I'm not an expert and as with all jobs in PhotoShop, there are many ways of ending up with the same result. This is just one of them. Most will know how to do this but it just might help someone just starting. Images 1 and 2. I wanted an image of the car with no bystanders in it. So I took one photo and waited till the man moved and took another. I arranged them with the image with the man against the part of the car with the straightest line. i.e. The bonnet, on top. Then aligned them. Image 3. With the Polygon masking tool, masked around the man on the top image. With the eraser tool, erase the masked area allowing the photo below to show through. Then with the eraser set to soft, softened the edges of the masked area, (except for the bonnet line), so there was no hard line. 4. Then merged the two images. Nicely done Brian. If you have PS CC I think it will do this for you but I have never tried it. I normally use your technique to remove people from railway station platforms. Thanks, John. I once saw a photo taken using this technique, in the Space museum in the US., with not a soul in it. I believe there were over a hundred images involved and just erasing the people (and there must have been hundreds) an empty hall was manufactured. As you say, in CC there is the content aware thing you could do this with, but like you, I've never tried it. ............................................ As you say, in CC there is the content aware thing you could do this with, but like you, I've never tried it. Wasn't thinking so much of that as this. I must give it a try. Thanks for this, Brian. As I am a fairly incompetent Photoshop novice I will find this very useful. I watched the tutorial, John, and realised that this is a much quicker and more accurate method than mine. The only problem is that (for me) it just wouldn't work. I spent all evening trying to make it work, ending up with the same result every time. My result from two perfectly merged images, had both figures still present, but at about 50% opacity. Absolutely no idea why! I would be interested to see if it worked properly on one of your railway platform images. Tried it on your two shots and one of mine and got the same result. It's clearly not perfect. I think that I will go out over the next few days and find an appropriate scene, possibly in a shopping centre or the local rail station and see how it copes.